Dental crowns are used for both restorative and cosmetic purposes and can play an important role in the long term maintenance of a healthy and functional smile. A traditional dental crown required at least 2 visits to our Annapolis dentist office before you could walk out with your permanent restoration in place. For many patients, the added inconvenience of multiple trips, additional cost and the hassles of a temporary crown could be a deterrent for taking care of dental problems that could be treated with a dental crown. Who has time for two dental visits for a single crown? Dr. Kian Djawdan is committed to providing the best possible patient experience with the latest in materials, techniques and technology for restoring damaged and missing teeth. He has incorporated CAD/CAM technology into our Annapolis dentist office which enables is to provide ceramic same day dental crowns, inlays and onlays that are as durable and natural looking as those made in a dental lab. 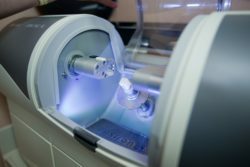 CEREC uses a state-of-the-art 3D camera to create a digital impression of the tooth. This digital image replaces the physical impression required in the traditional procedures, so you don’t have to wait for a tray of goopy impression material to harden in your mouth. Using CEREC software, Dr. Djawdan will design every detail of your restoration with precision and accuracy, ensuring the best possible fit. While you wait, your all-ceramic restoration will be created in our onsite lab with the CEREC milling unit, usually in just about 15 minutes. Dr. Djawdan will fit, polish and bond the restoration. And you can get back to your life. WHY CHOOSE DR. DJAWDAN FOR YOUR SAME DAY CROWN? CEREC has over 30 years of research and development. In 1997, Dr. Djawdan purchased his first CEREC unit and began designing permanent, all-ceramic restorations same day for patients. Patients benefit from the skillful artistry Dr. Djawdan can offer when creating a natural looking restoration to complement their smile that is gained from 20 years of experience and many hours of advanced training and education. The high level of skill that Dr. Djawdan offers can mean results that are not only beautiful, but comfortable and lasting. Using CAD/CAM technology for a dental crown, inlay or onlay offers many benefits for patients who have damaged teeth, tooth decay or cosmetic concerns. 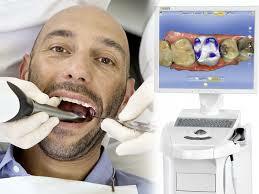 CEREC can be used to place dental crowns, inlays and onlays. These high quality ceramic restorations will not only restore lost function in one visit, but will enhance the appearance of your smile and support long term oral health. Do you have a broken crown, damaged tooth or missing teeth? If you have been avoiding dental care due to time constraints or dental anxiety, our dentist office in Annapolis can provide the solutions you need to get back the smile you desire, with minimal impact to your busy schedule. We offer comprehensive restorative dental care for damaged and missing teeth using the latest in advanced technology and techniques. Dr. Djawdan is one of few area dentists trained and certified in IV sedation, in addition to oral and nitrous oxide sedation alternatives. To learn more about how our advanced restorative services can offer solutions for your dental concerns, call us at 410-618-5966 to schedule a consultation with Dr. Djawdan or request one online. We welcome new patients from many communities near our Annapolis dentist office including Arnold, Crownsville, Davidsonville, and Severna Park.